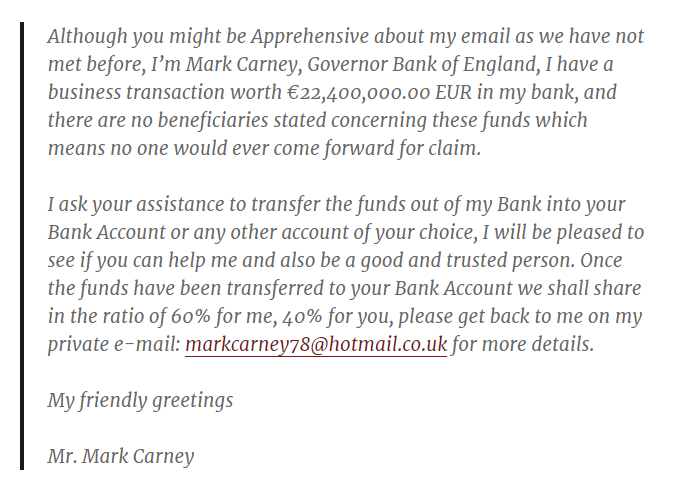 In July of 2013, Mark Carney was appointed the Governor for the Bank of England, and within mere months, he was the subject of a “Nigerian Prince” email scam. California native Cameron Smith was the target of this scam when he received an email from someone fraudulently claiming to be Mr. Carney. 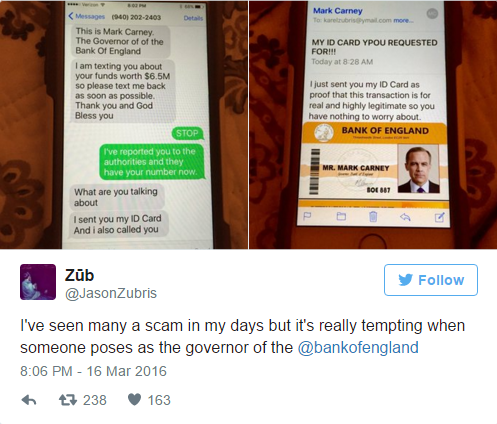 It appears that the Governor has been the subject of a scam again, as Twitter user @JasonZubris has been receiving texts proclaiming to be Mr. Carney. On March 16, 2016 Zubris received a series of texts and a follow up email in an attempt to obtain banking credentials from him. Never respond to emails that request financial information. Reputable companies, especially banks, will never ask their customers for passwords or account details in an email. Avoid clicking links if possible. If you need to visit a website, like a bank, physically type in the URL in the address bar. Keep a regular check on your accounts. Check your statements, and if anything appears to be suspicious, contact your bank or credit card company. Keep your computer secure. Install anti-virus software and keep the software up to date to disable any malicious software that may have entered your computer through a phishing email.